This Limestone tiled floor in Twickenham, Middlesex had only been laid eighteen month earlier. However, due to an in-effectual seal on the floor, the soil had accumulated and embedded into the pores of the stone. 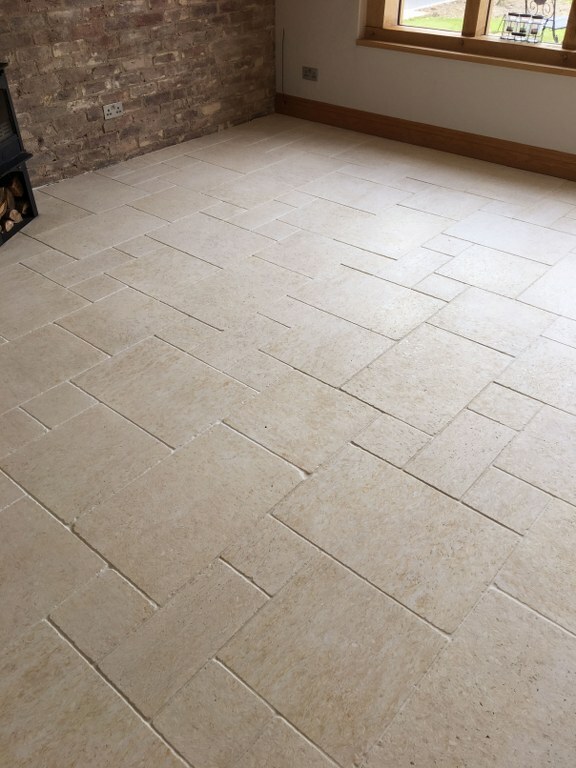 Limestone like many types of natural stone is a very porous stone and it doesn’t take much for the dirt to build up and start to discolour the floor. 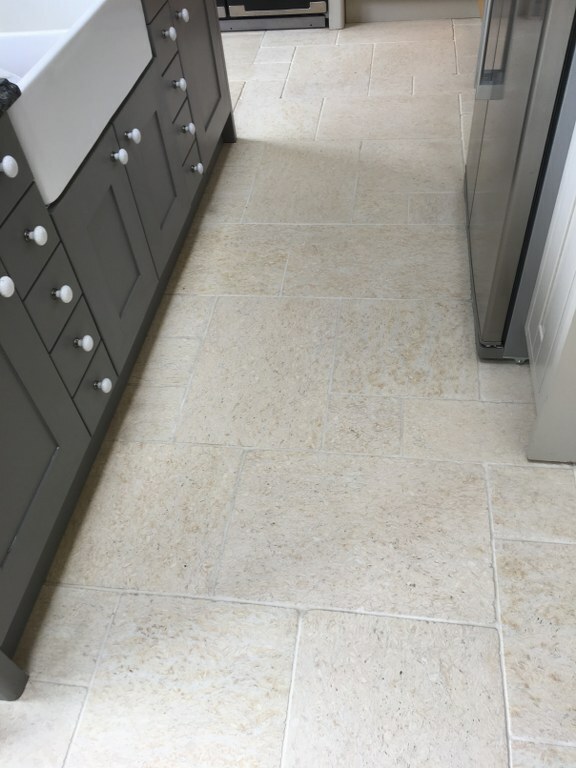 The tile had been laid through out the Kitchen and adjacent dinning area and the solution was quite straight forward and simply required and a good clean and re-seal as detailed below. We started with an application of a strong dilution of Tile Doctor Pro-Clean which was sprayed onto the floor and allowed to dwell for five to ten minutes. Following this, we used a heavy duty floor scrubbing machine in order to break the soil away and existing sealer from the stone. Once we were happy that the soil and sealer had been dislodged, we then removed all of the chemical and soil via our extraction machine. 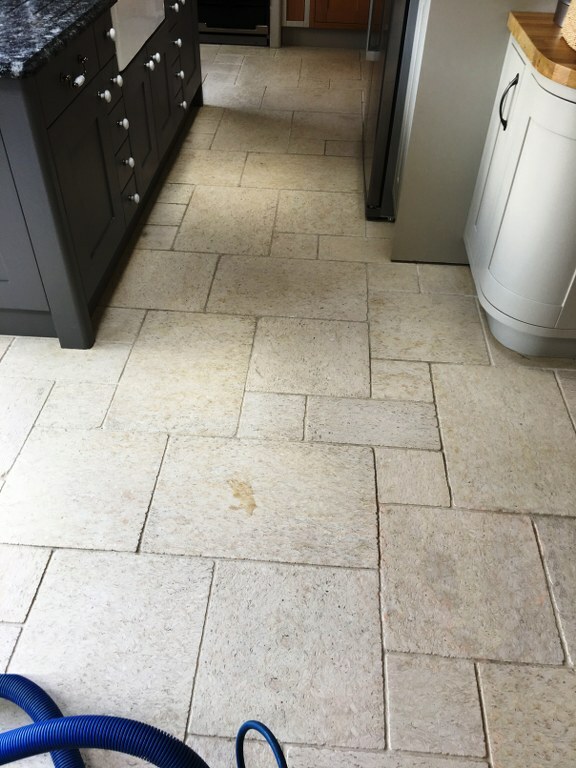 This applies pressured water onto the stone whilst vacuuming all of the waste away, leaving the floor as clean and fresh as it could possibly be. After allowing the floor to dry out overnight, we returned the next morning to apply the seal. Two coats of Tile Doctor Colour Grow sealer were applied to give the best protection possible. Colour Grow penetrates into the pores of the stone protecting it from within whilst also enhancing its natural colours and contrast. Once done the floor looked like it had just been laid and the customer was extremely happy with the end result.